Due to the efforts of His Holiness the Dalai Lama and so many other supporters we can enjoy & celebrate to have the first female Geshe — a big step forward in Tibetan Buddhism — though still a lot has to be done with respect to gender equality, e.g. the establishment of fully ordained nuns within Tibetan Buddhism. Now this really makes my heart sing! I believe that out of the ashes of various Dharma Centre debacles, a very fine form of Western Tibetan Buddhism is emerging under the guiding hand of HH the Dalai Lama. Both Western nuns and monks who have a genuine calling to the contemplative life can contribute much to setting an exemplary and inspiring standard so that we may appreciate Tibetan Buddhism at its best. yes this is really much inspiring and something that makes the heart sing. Nuns are also not involved in scandals. This is even seen that way in the Theravada tradition. Moreover most Westerners interested in Buddhism are women. She studied 18 years – an incredible amount of effort, hardships, joy, and merit is needed for this. Let’s rejoice in her deeds! of course it is an incorrect generalization to say “Nuns are also not involved in scandals”. thank you for pointing this out! However, compared with male sexual misconduct nuns don’t set such examples to such an amount as men do. I think this is save to say. Both genders seem to have their own strengths and weaknesses as humans just have it. There are also women who take fun and delight to seduce monks, and who wrongly accuse lamas for sexual misbehaviour. do we really need to stamp everything with HHDL? no, not necessarily but he is somewhat outstanding. e.g. as far as I can see HH Karmapa doesn’t address issues of (sexual) abuse. I know of a Kagyu person who is quite frustrated of how – according to his experience – Kagyupas treat sexual abuse of a certain lama. could you kindly explain this? I replied that I have problems to take this guy, Dr. Geoffrey D. Falk, seriously because what he puts together in the “HELLO, DALAI!” chapter is quite ridiculous because almost nothing has to do with the Dalai Lama who is in no way involved in any such scandal. I said, it appears to me the author gathered all controversial stuff to put it in the Dalai Lama chapter just to be able to include the Dalai Lama in the book. I said I cannot understand researcher who praise such a work because it has nothing to do with academic standards (at least not the Dalai Lama chapter). The researcher replied, he didn’t read the Dalai Lama chapter but now having read it, he agreed that it is indeed “confused”. well said. thank you very much for your comment! Personally I don’t care too much who calls whom his or her root guru. Nor I am interested to know this. It’s for me rather a secret topic that belongs to the Vajrayana. However, what concerns me is a tendency I can see in Western Dharma centres where people new to Buddhism are confronted with questions like “Who is your root guru? !” and then explaining (often a bit puffed up) who the own “root guru” is, as if this is the main issue of starting a spiritual path. The New Kadampa Tradition has stressed this topic again to an extreme. If one looks in the biography of past masters, e.g. Gampopa or Naropa, they have found their “root guru” at a certain point long after they have started to learn and practice the Dharma. While in the Gelug school formally everybody is your root guru who gave you a Tantric empowerment, commentary and transmission, as far as I heard, in Kagyue/Nyingma school only that teacher, that shows you the nature of your mind becomes your root guru. So most Westerners might not have any root guru according to the latter explanation while many Westerners might have many root gurus according to the former. There seems to be a high amount of confusion in this topic that deserves some further investigation. I found the explanation by HH Drikung Chetsang Rinpoche quite useful: http://buddhistische-sekten.de/wurzellama.html (its in German but it should be available in English somewhere too). Maybe we can use the opportunity to shed more light on this topic. What is your knowledge/understanding of it? This is very close to Tenzin’s perspective when he says that the question of whether or not a lama is one’s root guru is a personal one. I personally find this perspective very helpful. I was there! I find each of the definitions proposed beneficial. I must say I still find the current tendency to refer to HH as ones root guru when one has never even spoken to him about ones practice(or indeed at all) rather disturbing The dharma must move with the times I suppose but I fear for the existence of the tantric path under these latter day circumstances-how will people practice without the skilled personal guidance of a qualified master? That is good, Anon. However, while I could never know or judge your personal reasons for claiming HHDL to be your root guru, it does seem a little strange that you would disagree on a very fundamental level with his approach to the dharma– indicating that perhaps his approach is not really useful for you. Of course there is only some truth in this, also women can be involved in scandals, however, less likely in sexual scandals. This was an inspiring story that brought a lot of happiness to my heart this morning! Thanks for posting it, tenpel. It’s, of course, way past time, but hopefully her pioneering accomplishment will spark a landslide of other women to follow in her footsteps. I am excited to share good news with you. This month 27 Tibetan Buddhist nuns made history. 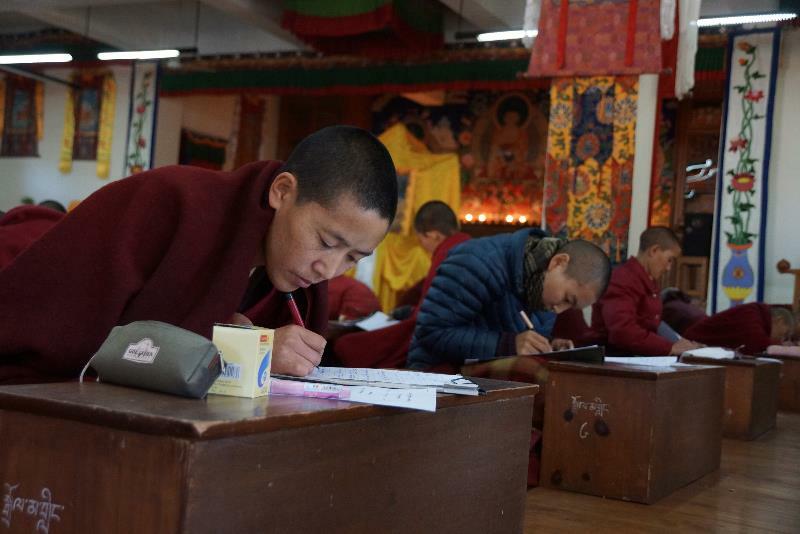 They finished the first round of exams for their Geshema degree – the equivalent of a PhD in Buddhist Philosophy. These stringent examinations are the culmination of a rigorous 17-year course of study. This is a landmark achievement for Tibetan women. Geshes, and soon also Geshemas, are the most educated monastics, carrying much of the responsibility for preserving and maintaining the Tibetan religion and culture. This will enable the nuns to take up leadership roles as educators for future generations of Buddhist practitioners. Some of the nuns sitting the doctoral exams were illiterate when they escaped from Tibet and could not even write their own names. Your kindness and generosity have made possible their immense leap in capacity. This would not have been possible without the support of His Holiness the Dalai Lama, the Department of Religion and Culture of the Tibetan government in exile and the compassion and generosity of Tibetan Nuns Project donors like you. We hope you will rejoice with us this historic milestone. Copyright © 2013 Tibetan Nuns Project, All rights reserved.